Every now and then, something comes along that really is a game changer. In recent history, that has been the introduction of CHIRP fish finders and solid-state RADAR with processing capability like DOPPLER shift detection. It is time for the next major advance. Welcome, Multi-Beam Transducers! Well, multi-beam systems have actually been around for a number of years, starting with the US Navy in the '60's and by the late '70's there was a commercial version. Through the '80's and '90's, further development led to more wide spread use for research, sea floor survey and resource exploration. Within the last five years, we have seen the introduction of affordable, high frequency multi-beam units by manufacturers like Garmin, Simrad and Raymarine. These units offer the typical recreational angler incredible performance value and several selections to customize each system for that particular boat. These high-frequency solutions work well in the upper water column, but can be a limitation for our areas of fishing and the depths that are encountered on local fishing grounds in Alaska. That is why the Furuno DFF3D is such an incredible addition to the tools used by serious anglers and commercial operators in the Last Frontier. 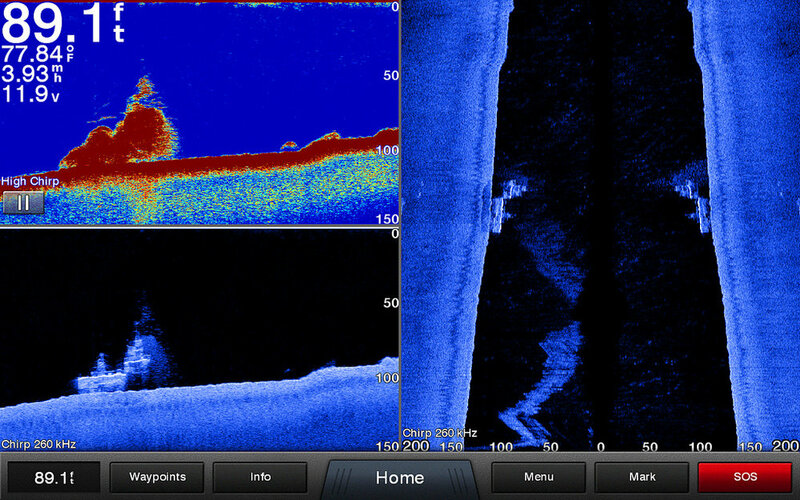 To use a fish finder effectively, one has to know the shape of the beam that the transducer has. This is normally thought of as a cone with the point at the transducer and a large "spotlight" on the ocean floor. 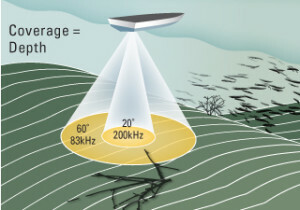 Using dual frequency transducers, most commonly packaged as dual-beam, it is possible to get an idea of what is directly under or near the boat. (see Fishfinder; What Do I See?) There is a fair bit of interpretation to relate a target echo with it's exact location under the keel. The multi-beam transducer presents a different beam width and pattern on the sea floor. This allows software to interpret and display echo images like 3D water column or side-scan views. This greatly reduces the amount of echo interpretation the operator has to perform and enhances the understanding of underwater structure. The simple fact that the machine can do the interpretation makes it easy for any operator to have a clear picture of what is under the boat. When this type of transducer is matched with the ability to save bathymetric information, the combination reaches a new level of capability, and that is where it is apparent that this is truly a powerful tool. Where a single beam transducer will record a single point of data on each reception, the multi-beam allows 10's or 100's of points of information each reception. 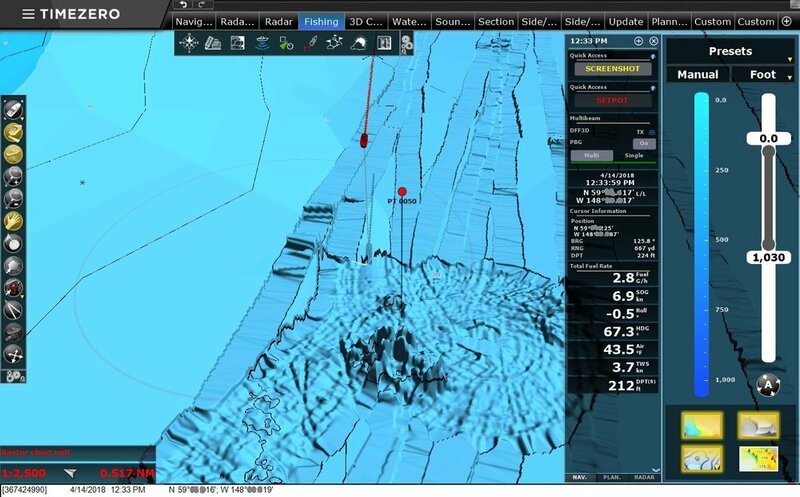 So, if you are going to save data to a program like TimeZero Professional, using a multi-beam system will gather data many times (approximately 40x with DFF3D) faster than a traditional sounder would. 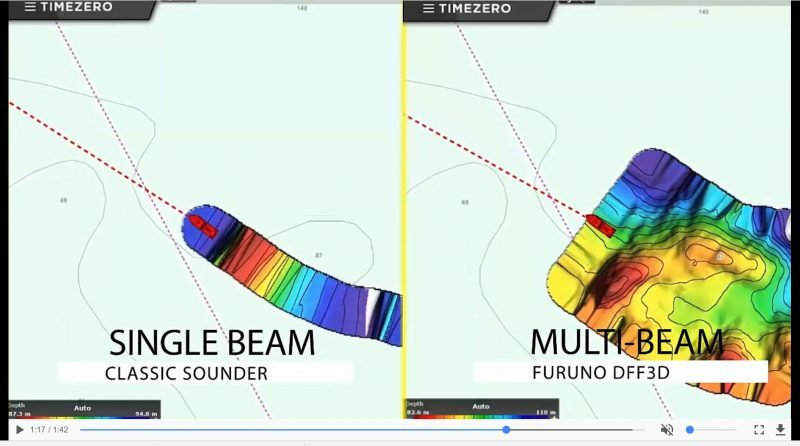 Note single beam recording vs. multi-beam recording to Nobeltec TimeZero Professional with Furuno DFF3D recording PBG data; Blying Sound, North-Gulf Coast, Alaska. It's a good time to be in the market for multi-beam sounder technology. The capabilities available for small boats rival systems used for survey work just a few short years ago, which demanded large investments. True tide corrected and motion stabilized data can be collected and viewed at any time on competitively priced systems that fit into sport boats. It's not a good time to be a game fish.